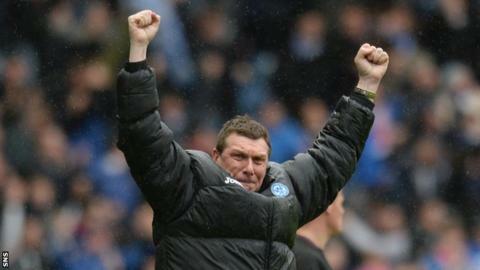 Motherwell's Stuart McCall believes his St Johnstone counterpart, Tommy Wright, should be named manager of the year. Neil Lennon secured his third straight title, Derek McInnes won the League Cup and Jackie McNamara guided Dundee United to the Scottish Cup final. However, McCall believes Wright has outshone his rivals in the top flight. "To get to a cup final, get to another semi-final and finish in the top six, Tommy got my vote," said the Well boss. Wright replaced fellow Ulsterman Steve Lomas at the helm in Perth and has handed Saints their first ever crack at the final of the Scottish Cup, something that had consistently proved elusive. He also gave the club's supporters a memorable early-season run in Europe. "If you look at everyone, Neil Lennon could get 100 points having gone through the season breaking so many records, Neil's obviously got to be a strong contender," McCall told BBC Scotland. "Then you go down to Derek McInnes who's done a fantastic job, won a cup, could finish second. "Jackie McNamara, could win a cup, could finish second. "But, Tommy Wright for me, to get to a cup final, get to another semi-final and finish in the top six, he got my vote." "I remember them starting so early in Europe and having a fantastic result against Rosenborg," added McCall. "We all know the resources that St Johnstone work under as well. "I think he's done a fantastic job. Taking over from Steve Lomas would have been a tough job for him. "Derek would've got my vote if they'd got through the semi-final last week but Tommy Wright got my vote." Ahead of this weekend's matches, McCall's Motherwell still have high hopes of a second successive second-placed finish in the Scottish Premiership. They have currently amassed 60 points, their highest accumulation at this stage of the season in 80 years. But that is still only good enough for third with five matches of the campaign remaining with Aberdeen three points clear ahead of their trip to face Inverness Caledonian Thistle on Friday evening. Their toughest post-split fixture on paper is first up with the Steelmen failing to even score a goal against Celtic so far this season. They will also likely have to deal with a midfield crisis with captain Keith Lasley suspended and Paul Lawson and Stuart Carswell injured against a side who thumped them 5-0 on their last visit to Fir Park. But McCall does not feel the game will be pivotal to their hopes of finishing in the runners-up spot. "We're light in that central midfield area without a doubt, maybe if I could roll the clock back and three stone ago I could have got a game," he said. "I'm an optimist but I'm also a realist. They were excellent that day, they picked us off on the break. There's no getting away from if good players play well on the day, it can be difficult. "In my time here we've managed to beat them three times but in every one of those games you have to rely on a little bit of luck sometimes but we have got to have everyone playing as well as they can." Less than a fortnight has passed since Motherwell's controversial defeat at St Mirren, a come-from-behind victory for the Buddies that was instigated by a dubious penalty decision. But McCall insists he is not concerned with that now. "Obviously at the time you're aggrieved and in fairness to the referee, he contacted me afterwards and apologised," he added. "He made a mistake. I made plenty that day with the substitutions that I made. "There's doubt we've been on the wrong end of the stick with decisions this season but it was one of those things. "I think with the third goal we were still in shock. It was a sore one and losing ground on second place, but we have to just move on and focus on tomorrow's game."